My card, today, was inspired by the terrific sketch from the Mojo Monday blog. 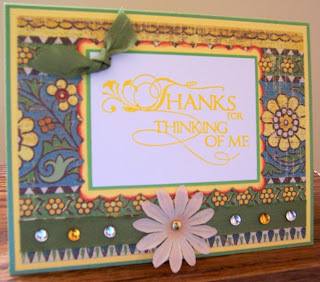 The challenges are fun and a great opportunity to see cool designs by other card-makers. 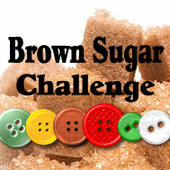 You, too, can participate in the Mojo Monday weekly challenge...they're open to everyone. Be sure to post a photo of your card to a personal blog or Splitcoaststampers gallery using the appropriate keyword (Mojo68, Mojo69, etc.). For this card, I used some left-over patterned paper from K&Company's Wild Saffron collection and added a few baubles and ribbon. The sentiment "Thanks for thinking of Me" is from Inkadinkado. The base of the card is metallic cardstock from The Paper Company.